Been working more on Falkner today. I've almost finished the jacket except for hemming the front and bottom as well as adding the white bottom trim and the pom poms. I didn't take any photos of the progress but the jacket is like a mutation of a haori. The sleeves are short but kinda wide and the jacket is bell-shaped with an open front. 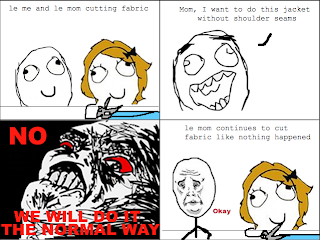 Oh, and let me share you what happened yesterday evening when me and mom were cutting out the pieces for the jacket.. rage comic style! Mom got this rageburst out of the blue when I told her I'd rather do it without shoulder seams, Falkner's outfit clearly is inspired from traditional Japanese clothing after all. She was so scary I went all okay-guy and as soon as I had submitted to her will she was all happy again. 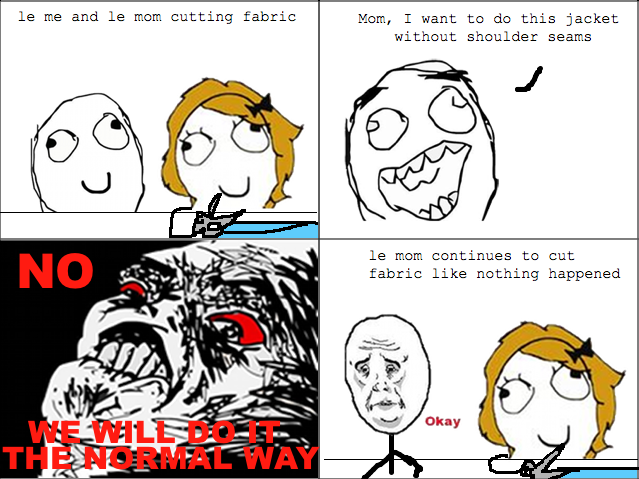 Dafuq mom. Some hours after mom came home she helped me with figuring out a way to make Falkner's... feet... things. I seriously don't know what to call them. lol They are finished I hope except for adding the elastic bands to keep them in place. I will fix that next time and hopefully finish the jacket too. Then I just have left to fix Falkner's shoes if I'm not missing something. I know I should have some black almost unworn shoes somewhere which are close enough for me.. but.. of course when you need something you won't find it even if you turn the whole house upside down. Guh. I guess that's it for today. 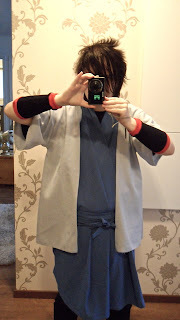 More progress next time and if I'm lucky I might be able to do a Falkner cosplay preview test before leaving for Skecon. Time will tell. päivän pelastus tuo ragecomic! Mä voin jotenki niin kuvitella ton tilanteen! ja hyvältä näyttää cossi vaikka en hahmoa niin tunnekkaan.